Where Smart Practice Meets Strong Performance! At Fusion Gym, we are committed to helping you practice with an eye toward performance. Whether you want to lose weight, train for a specific event, or just feel your best, our IN*Fused system will help you assess your skills quickly and take systematic steps toward measurable goals. Fusion Gym offers both team fitness (small group classes) and personal training. Both options leverage our functional movement IN*Fused approach. Features include the seven-point functional movement (FMS) assessment system, used in pro athletics, plus traditional aerobic exercise, weight lifting, and metabolic conditioning. 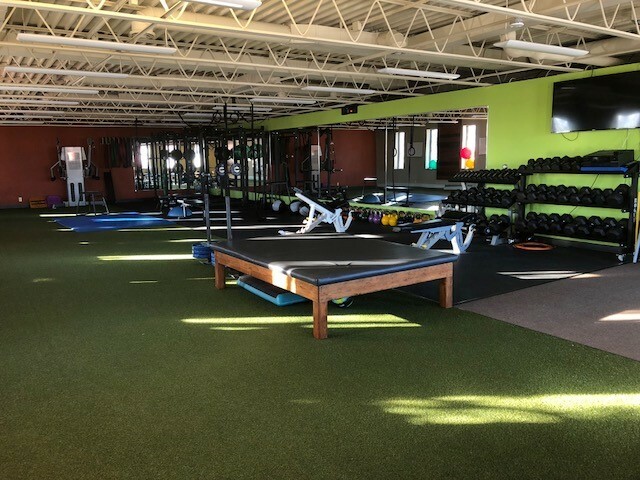 For our popular team fitness approach, we offer memberships with access to classes for the best value. Our 55-minute sessions accommodate all athletic levels and ages by providing multiple progressive stations based on fitness level. For personal training routines, we cater methods and protocols to individual needs. All training, team or personal, is conducted by our semi-private coaches, so you receive the proper correction, motivation and encouragement to progress in your training. Learn more about the Fusion philosophy. Life happens and your fitness needs change daily, so we offer the ease of scheduling all services online. Team fitness classes are limited to 16 individuals, and you must sign up online prior to each session. Sessions are designed to accommodate all ages and performance levels. Each session is 55 minutes long. Please arrive 10 minutes prior to your session to allow time to change out of your street clothes. We recommended wearing minimalistic/low-profile footwear, shorts and athletic wear. No street shoes or street clothes allowed.